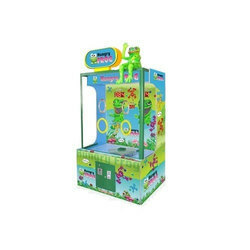 In order to fulfill the demands of our esteemed clients, we are engaged in providing an optimum quality array of Simulator Game Machine. Backed by years of industry experience, we are engaged in offering a premium quality range of Game System. Pandora Fighting Games1. 32inch Led2. 3ft x 2.5 x 5ft3. 6 Month Warranty4. 1300 Fighting & Racing Games. This is a full interactive system with head tracking .system uses Oculus rift DK2 VR Gear and the platform will move in 3DOF with electrical Piston and also will rotate in 360 Degrees . You are a character in the game with full power.3 People can enjoy the ride at a time. A very fast income generator for Indian investors.Contact us to know more about the product.